Another frequent caller was Nathanael Greene, a successful merchant who was a distant cousin of Uncle William’s, and who was fourteen years older than Catherine. Nathanael was born in Rhode Island in 1742 to Quaker parents. His education, though not formal, revealed that he was a good student. He possessed a keen mind, excelled in mathematics. After a quick courtship, 19-year-old Catherine Littlefield married Nathanael Greene on July 20, 1774. Following their wedding, the couple moved to Nathanael’s home in Coventry, Rhode Island, which was built in 1770. They spent less than a year there before the first shots of the American Revolution (1775-83) were fired. Nathanael’s family business, iron forging for ships, became his trade. After the Gaspee Affair in 1775, in which his family was accused of involvement in burning a British revenue ship, Nathanael began to take an interest in the growing discontent in the colonies. It was this interest that led him to the military, a choice that was in conflict with his religious upbringing. Catherine had not yet settled into a comfortable life with her husband. She was still dreaming of spending cold winter nights with him, reading to each other by the firelight, surrounded by their children. Catherine was energetic and independent, but she looked to her husband to take charge and make the decisions. With his involvement in the war, she would have to assume that role. Greene – a pacifist Quaker with a limited education who suffered from recurring bouts of asthma and a limp caused by a childhood affliction – seemed an unlikely person to become known as a Revolutionary War hero. But his abilities as a leader were quickly recognized, and in 1775 his historic military career began. Charged with raising the Rhode Island Army of Observation, he was selected by the Rhode Island Assembly as brigadier general, in charge of Rhode Island’s three Continental regiments. He traveled to Massachusetts with his troops in May. During the siege of Boston a month later, Greene commanded troops on Boston’s Prospect Hill. Catherine remained in Coventry, where she gave birth to their first child in February of 1776, naming him after General George Washington. Nathanael remained in Boston until the evacuation of British troops a few months later, and then moved his army south to Long Island. 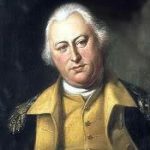 In August 1776, he was commissioned a major general, but he was stricken almost immediately with a serious illness and returned home to recover. During the war, Catherine was not content to sit at home awaiting word of her husband. Instead, she visited him at his headquarters and joined him at his various encampments. She endured the difficulties of a woman traveling over difficult terrain by horse and carriage, and was constantly in danger of being captured by the enemy or of being assaulted by highwaymen. Her presence at the front endeared her to the troops and to the other military leaders. George and Martha Washington became friends and supporters of Greene. Over the course of the war and shortly after, Catherine had five children who lived past infancy. Nathanael was present for only two of their births. She was faced with the conflict of caring for her children, yet longing to be with her husband. She desperately wanted to have something like a normal family and when conditions allowed, she brought her babies with her to camp. At other times, she left them in the care of family or friends, who were critical of her conduct. It was during these separations that Catherine most felt the effects of the war on her family. 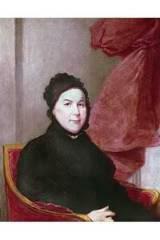 She became pregnant with four of the couple’s six children during her husband’s tour of duty in the Continental Army. A daughter, whom she named Martha Washington, was born in March of 1777. The pregnancy was not an easy one, and Catherine remained bedridden. She was instructed to partake of a common but potentially deadly cure by ingesting four grains of mercury a day. In early June of 1777, after several months of illness, Catherine felt well enough to travel, and was welcomed at the Beverwyck, New Jersey, country house of Abraham Lott, which was located close to the site where Greene’s army was camped. On September 11, 1777, Greene again engaged with British troops at the Battle of Brandywine. In November, he returned to New Jersey in a vain attempt to protect the fort at Red Bank. A month later, Washington and his troops set up winter headquarters at Valley Forge, Pennsylvania. Catherine joined her husband during this dismal encampment and shared his small, cramped quarters and the meager military fare. The following spring, Greene was appointed quartermaster general. General Washington ordered General Greene to Rhode Island to aid General Lafayette in preparing for an attack there. The Battle of Rhode Island took place on August 29, 1778, when units of the Continental Army attempted to recapture Rhode Island (now Aquidneck Island) from British forces. The battle ended inconclusively, but the Continental Army had to give up its goal of capturing the island and securing Narragansett Bay for American and French ship traffic. Catherine traveled with her husband to Philadelphia, staying with patriot John Cox and his family in Trenton along the way. While Greene went ahead to address Congress, his wife remained with the Cox family before continuing on to Philadelphia in mid-January of 1779. By February, the family had returned to Camp Middlebrook, New Jersey. 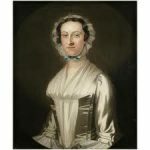 At the end of May, Catherine was pregnant once again, and returned home to Rhode Island, where her third child, Cornelia Lott, was born in September. A month later, Greene was ordered to rejoin Washington’s army at Fredericksburg, New York. Catherine joined her husband at West Point, New York in mid-November 1779, but returned to New Jersey to give birth to her second son, Nathanael Ray, in mid-January 1780. On June 7, 1780, Greene commandeered the front line against a British advance at Connecticut Farms, New Jersey. Three days later, as the conflict again showed signs of escalating, Catherine returned with her children to her home in Rhode Island. For eleven days in September 1780, Washington placed Greene in temporary command of the Continental Army after he found himself delayed due to Benedict Arnold’s treachery at West Point. Greene presided over the military tribunal that convicted Major John Andre to death for aiding Arnold in his attempt to surrender West Point to British forces. Catherine was looking forward to joining her husband again when word arrived that he had been appointed commander of Washington’s southern forces. In early December 1780, Greene arrived in North Carolina, and received command of the Southern Army, which had suffered several defeats. His conduct of the war in the South for the next three years was to be so successful that it broke the back of the British war effort in America. 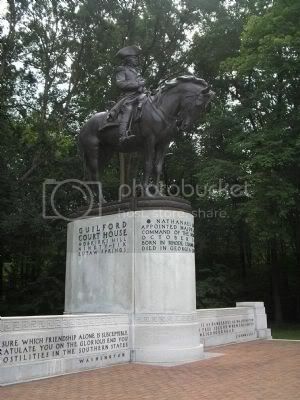 Greene rebuilt the army and fought the British at Guilford Court House, North Carolina, on March 15, 1781. There he and fellow general Daniel Morgan distinguished themselves against General Charles Cornwallis, by inflicting heavy losses on the enemy and forcing a British retreat. Catherine was not able to join Nathanael at his headquarters in Charleston, South Carolina, until 1781. By then their fourth child, Nathanael Ray, had arrived. After independence was won in 1783, Greene was offered the post of Secretary of War in the new government. He twice declined it, preferring to return to his home in Rhode Island. That same year a third daughter, Louisa, was born. Catherine went on to have another child, also named Catherine, who died as an infant c. 1785. Catherine looked forward to having Nathanael there to share in the responsibility of raising the children and handling business and household affairs. His presence at home “brought a peace of mind unknown to her since the conflict began.” She was prepared to let Nathanael take charge and settle herself into the life of a respected, well-to-do gentleman’s wife. Greene’s involvement in the war had effects in other areas. During his command in the South, he faced harsh conditions. In order to clothe his soldiers during the winter, he had to personally guarantee thousands of dollars to Charleston merchants. At the end of the war, the merchants began pressing him for payment. He was without sufficient funds and heavily in debt. Catherine did not adjust well to the idea of being poor. In the fall of 1785, the Greenes left Rhode Island, and moved south to lands that were given to Nathanael by the states of Georgia and South Carolina in gratitude for his military service – the family’s wealth had diminished during the course of the war. This was a difficult move for Catherine; she would be leaving behind many friends and what was left of her family on Block Island. The children’s tutor, Phineas Miller, accompanied them. They made their new home at Mulberry Grove, a plantation near Savannah. There, Nathanael hoped to make a living by cultivating rice, and to pay off their debts by selling their other lands when the market proved favorable. While Mulberry Grove proved unprofitable because Greene’s Quaker beliefs prevented him from using slave labor, life at Mulberry Grove proved a happy one. It had been happy for me if I could have lived a private life in peace and plenty, enjoying all the happiness that results from a well-tempered society founded on mutual esteem. But the injury done my country, and the chains of slavery forging for all posterity, calls me forth to defend our common rights, and repel the bold invaders of the sons of freedom. Catherine soon began to realize how heavily these burdens weighed on Nathanael. The twinkle in his eyes was gone. She now saw before her a “tired, haggard ex-soldier who had given himself to a belief,” and had signed away his future life for the cause of freedom. Catharine resolved to do everything in her power to help him. She settled into the arduous domesticity that plantation life required, determined to make Mulberry Grove a success. Their plans were never completed, however. 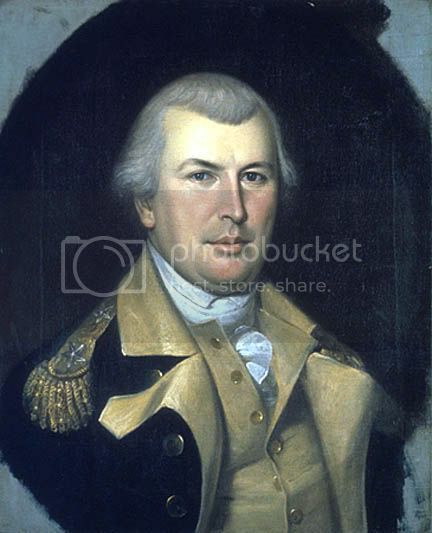 After almost a year spent in the society of his beloved Catherine and their many friends, General Nathanael Greene died suddenly on June 19, 1786, possibly of sunstroke, at the age of forty-four. After her husband’s death, 31-year-old Catherine decided to remain in Georgia, and took on the familiar role of being both mother and father to her children, who now ranged in age from three to ten. She also met the pressures of handling her husband’s devastated finances with courage and determination. She showed herself to be a competent businesswoman in her management of the plantation. With the help of the new plantation manager, Phineas Miller (previously her children’s tutor), Mulberry Grove was thriving by 1788. President George Washington visited her during his trip through the south in 1791 to make sure the widow of one of his most trusted generals was well cared for. I can tell you my Dear friend that I am in good health and spirits and feel as saucy as you please – not only because I am independent, but because I have gained a complete triumph over some of my friends who did not wish me success – and others who doubted my judgment in managing the business, and constantly tormented me to death to give up my obstinacy as it was called – they are now as mute as mice. Not a word dare they utter… O how sweet is revenge! In 1792, Catherine rented a room at Mulberry Grove to a young Yale College graduate who had traveled south from Massachusetts in search of a teaching job. The young man’s name was Eli Whitney, and his skills as a handyman were of use in maintaining the large plantation house. Whitney became intrigued when Catherine explained how unprofitable it was to raise green-seed cotton, due to the time involved in cleaning it. Tradition holds that she suggested that Whitney build a machine that could clean seed cotton. Perhaps her prompting went only that far, or perhaps she provided a more detailed suggestion, maybe even a rudimentary design. In any case, Whitney’s mechanical skills transformed Catherine’s idea into a reality. Within a year, Whitney had produced the cotton gin, a machine for separating the cotton from its seeds. On March 14, 1794, Whitney received a patent for the cotton gin. 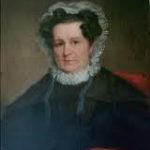 By some reports, she financed the patent and fabrication of Whitney’s cotton gin (“gin” being short for “engine”), perhaps because women were not allowed to hold patents. What is known is that Catherine provided financial backing and a workshop; that she had more experience than Whitney with cotton and the problem to be solved (de-seeding); that she had to sell Mulberry Grove to offset the costs of lawsuits arising from patent disputes; and that Whitney paid her royalties on his patent. Catherine moved her family to Cumberland Island, Georgia’s largest and southernmost barrier island. There she and Phineas established a new home on land that had also been given to Nathanael. Located near the southern end of the island, the plantation was called Dungeness, and it thrived. During the spring of 1793, Catherine’s oldest son, George Washington Greene, drowned during a canoe trip up the Savannah River with a friend. Eighteen years old when he died, George was buried on the plantation. In 1901, the remains of both George and his father, General Nathanael Greene, were re-interned next to the Greene Monument in Johnson Square in Savannah. In 1796, after a long courtship, Catherine married Phineas Miller. He had grown in her esteem while serving as both her plantation manager and a tutor to her younger children. Eventually Miller was elected to the state Senate. In 1803, Phineas Miller died. Catherine Littlefield Greene stayed at Dungeness until her death on July 20, 1814, at the age of fifty-nine. In an 1883 pamphlet titled Woman as Inventor, author and feminist, Matilda Joslyn Gage, first put forth the claim that not Eli Whitney, but Catherine Greene invented the cotton gin.